Diego costa has reveal one of the reasons he left Chelsea for Athletico Madrid, stating he left stamford bridge because of Antonio Conte's behaviour toward him. I was unsatisfied the way i left Chelsea because of his behaviour , "he told marca" Diego Simeone is a very straight forward manager, he is different from any other coach in the world due to his way of handling situation . We made him champion but he later text me saying he didn't want me without telling me the reason. 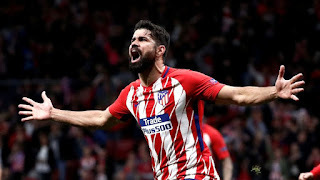 Costa first spell in Athletico madrid ended in 2013-2014 season after helping them to win their first La Liga title since 1995-1996 season, in his spell in England he help Chelsea lift the Premier league on two occasions. His second spell begin in the second half of last season where he help Athletico madrid to win Europa league.